Winter is a dormant period for many plant diseases. Unfortunately, the cold weather doesn’t kill most plant pathogens especially here in the Piedmont of North Carolina where our winters are fairly mild. Fungi, bacteria, nematodes, viroids, phytoplasmas, and viruses cause plant diseases. Let’s focus on viral and fungal pathogens that you can do something about now, and which cause about 85 percent of plant problems. They live everywhere, in the soil, in plants and can also survive via a host or a vector, usually an insect. They have adapted well to the environment, some even have a protective covering that can last for over two years. So, what can you do now to help reduce these problems? The first step is to keep a keen eye on your yard and garden all year, and note any change in the color, shape or function of a plant. Look for symptoms of disease on deciduous and evergreen leaves, stems, branches, trunks and the roots of plants. A common problem you can spot now is anthracnose. Anthracnose is a general term for the damage to deciduous trees and shrubs; it is a fungal pathogen that overwinters in dead leaves and twigs. 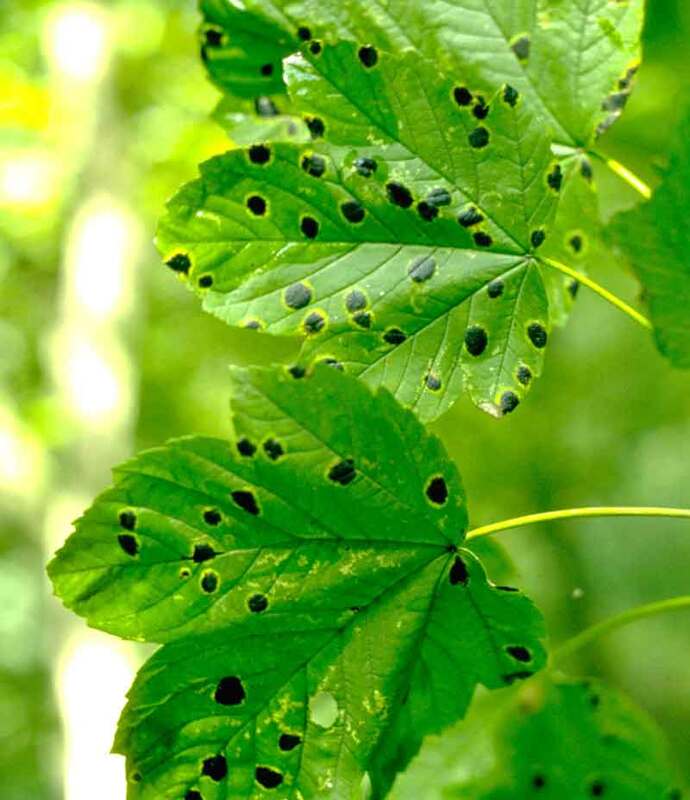 Look at fallen leaves for unusually spots such as tar spot, black spots that are found on maple tree leaves, and check for scab or canker on twigs and branches. When you do find these problems, you will need to remove the dead stems and prune infected branches, then make sure to rake up those leaves and remove them from the garden. This will also take care of any eggs laid on leaves by insects waiting to hatch in spring. Viral infections are more difficult to recognize and are systemically introduced to plants. They can infect a plant via any living organism through wounds like those from sucking insects such as aphids. Typical damage appears on flowers or leaves as lesions, yellowing, strips or streaks, and leaf curl or roll. A virus won’t usually kill the plant if it is healthy so you just want to control it by removal of the infected area now and then use an insecticide, nematicide or fungicide in the spring and summer. If you do find that the majority of the plant is infected, you will have to remove the entire plant to prevent further spread. If you have not already cut back your roses, look for rose rosette (witches-broom) on all your roses including Knock Out roses. In time, this viral disease will kill the plant and spread to other roses. Don’t wait until spring to clean up the infected and dead materials; removal will help to reduce re-infection once the weather warms. We are lucky to have mild winters and sunny days in the Raleigh, North Carolina, area that make being outside so enjoyable. So inspect your yard every season to try and keep infection rates low and your plants healthy. Healthy plants and early intervention will keep your garden beautiful. Stay busy with good gardening practices that include crop rotation, managing pest populations and proper disposal of infected plants. It is hard to identify what is actually causing the problem even for experts, so remember that you can always consult a professional for help.